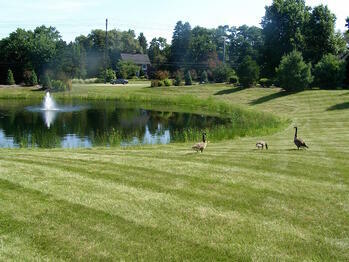 Schill handles the maintenance for the 23-acre property, including mowing, caring for landscape beds, enhancements and seasonal décor. 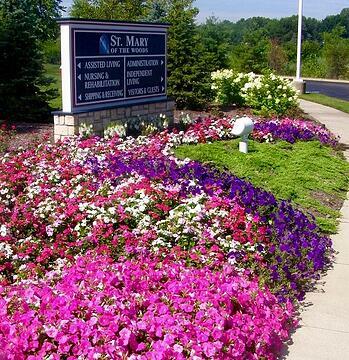 St. Mary invests up to 40 percent of its landscaping budget on the “extras” that make the property stand out. That includes a grand fall display complete with pumpkins, cornstalks, hay bales and mums, and sparkling holiday lights and winter décor. That’s especially important in such a competitive industry, Csalos points out. “We want to be a facility that stands out,” he says. 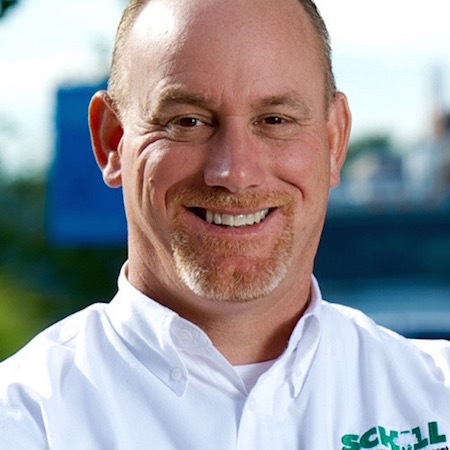 Jim Schill, co-owner and executive vice president of Schill Grounds Management, works directly with St. Mary of the Woods maintenance staff headed by Csalos to accomplish the property’s multi-faceted goals. “We work hand-in-hand with their management team,” Schill says of the importance of constant communication to carry out the property’s mission to be a first-class facility. “We communicate a lot with each other, and that makes it a win-win situation,” says Schill of weekly personal stops to the property aside from crew visits to mow, prune, trim, clean up beds, plant flowers and more. Csalos emphasizes how open communication and accessibility have made the working relationship seamless and rewarding. “Schill goes out of the way to make sure it gets done — any special projects or seasonal décor we need,” he says. Response time is critical. Csalos relates how after an Ohio Department of Health annual inspection the facility was required to relocate hay bales from the fall display that were stacked under the entryway porticos. Pristine results require “all hands on deck.” That includes in the landscape beds, where bushes require ongoing pruning to avoid looking overgrown. When Schill first began working on St. Mary at the Woods, Csalos relates that the bushes looked like hot air balloons. 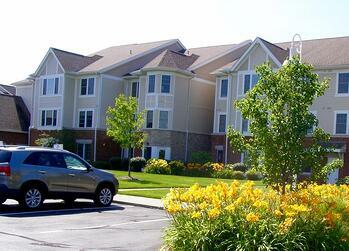 It’s all about the residents. 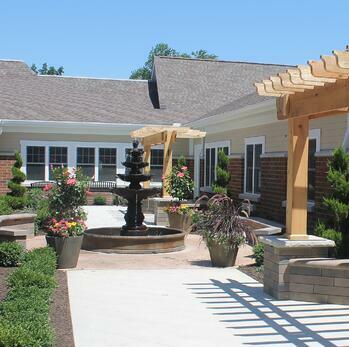 “Everything we do here is for them,” Csalos says, adding that the landscaping not only draws people into the facility and is a highly visible property in the community, it also provides beautiful spaces for residents to enjoy. “Residents can walk along a path and enjoy the lush, green areas — the back of our property looks as good as the front,” Csalos says. Beginning in the fall, Schill Grounds Management transforms St. Mary of the Woods into a harvest-themed environment. Summer plants are removed from beds and replaced with varying colors of mums and cold-hardy pansies. Entryways are decked out with pumpkins, gourds, hay bales and cornstalks. “They prioritize seasonal color rotation and we dedicate the team and resources to dress up their entryways and beds for fall and the holidays,” Schill says. Enhancements go beyond the expected at St. Mary of the Woods, including a recent and significant renovation that Schill Grounds Management managed from start to finish. The commercial landscaper's crew moved an 1,800-pound fountain into the facility’s courtyard following a new addition to the facility. Schill brought on an architect, created designs for the new space, and carried out the construction. “Our team and their team got together, and we worked out a plan to manually get the fountain into the courtyard space,” Schill says. Working as true partners is what makes the relationship such a success, Csalos adds, noting that Schill Grounds Management cares for the property year-round, including snow removal in winter. “If we need anything, we call and Schill is out here almost immediately,” he says. Together, they create an inviting atmosphere for visitors and residents. 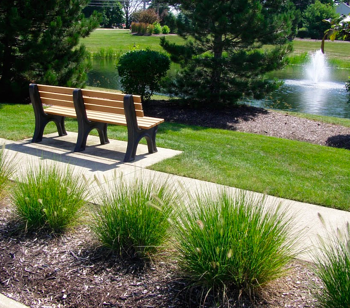 Csalos says, “It’s so important for us to take care of the grounds, and give residents beautiful things to see” — all year long.